We are back at Slasher Studios with a taste for zombies as we look at horror editor Derrick Carey’s pick for his Inspired Scares installment. Carey is the editor behind such awesome horror documentaries as “Sleepless Nights: Revisiting the Slumber Party Massacres” and “Screaming in High Heels: The Rise & Fall of the Scream Queen Era”, both are which are must sees for fans of 80’s slashers. Are you ready for a zombie party? “Augusta, WI isn’t particularly the most notable place on the map. Rural farming community, home of a Bush’s Beans plant, the towns pride is the high school football team (the BEAVERS) winning state in the early 90’s. Being someone from an early age that wanted nothing to do with anything listed above, having been born and raised until 11 in the lower suburbs of Chicago, often my time was spent in a world of my own, or actively find ways to escape into someplace else. Movies were that place in many ways. My family lived on a farm 5 miles from town. Down the street from us was a church, and further down the road was a cemetery on the hill. In all the times I passed this cemetery did I ever once think of it as anything more than a bunch of rocks on grass. Sure, I had family members die and such places held symbolic significance, but this particular place really felt like nothing more than another view on the way down the road; a picture, not a place of the dead. 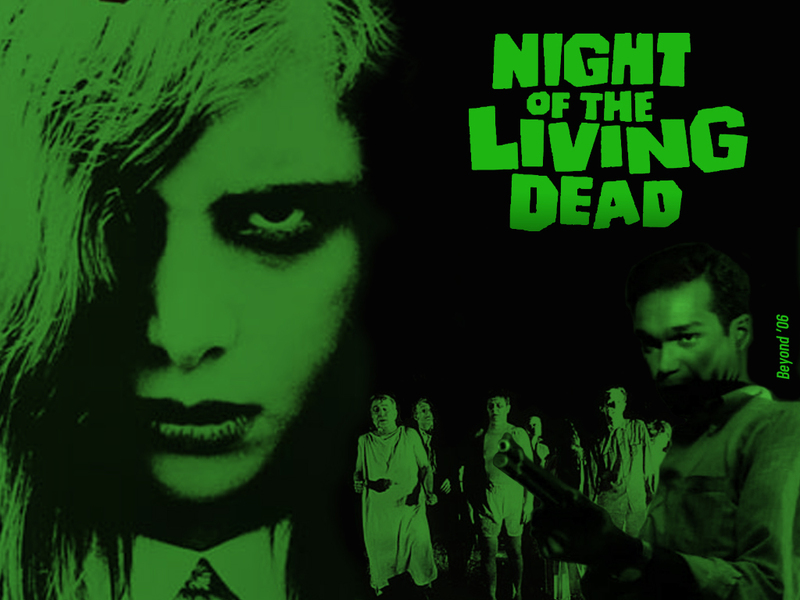 Late one night, all alone, as my family often left my brother and I on the weekends they would travel up north to a cabin they owned, I popped in the original Night of the Living Dead in on VHS. To those that have never lived in a rural setting, or in a country farm house where your nearest neighbor isn’t within shouting distance, it’s hard to explain the type of isolation you feel at times. When night hits, and it’s overcast, it gets dark….really dark, and vice versa on clear nights when the moon is in full swing. As normal, all the lights were out, and the sound was cranked. I had seen the film a few times at that point, but this time was different. It’s claustrophobia became increasingly real, sending my mind into thoughts of my own environment. The cemetery down the street became eerily similar to the one that Judith O’Dea frantically escapes from Bill Hinzman in the classic first scene of the film. Slowly, as the impending doom of the cast set in, my mind wandered to thinking of locking windows, shutting blinds, and flipping on all the lights. The film really affected me that night. Little did I know, it would live with me well beyond it as well. After that memorable viewing, I read up on the film feverishly. Found out through documentaries how they made the film and in turn how film was made. I no longer found film to be something that I passively viewed. I found it to be something I actively deconstructed and thought about well beyond it’s superficialities. My obsession became much stronger and I devoured, much I am sure to my family’s chagrin, as many films as I could. From that point, the seeds of filmmaking were born in me. Little did I know then, I would stumble across yet another George Romero film that would stick with me all the way into my late 20’s when I was pursuing actually trying to make films. Document of the Dead, the behind the scenes documentary on the making of Romero’s Dawn of the Dead, contained a portion of the film that illustrated his particular style of filmmaking through the fact that he edited everything he made. This section showed as an example the opening scene to my favorite Romero film, the hugely underrated Martin. In this section, they showed how meticulous Romero was about the amount of coverage shot and how he took all these shots and made them work within his edit to create the tension filled game of cat and mouse Martin plays with his first victim on the train, and the flashbacks he is haunted by in his head. Up until that point I had never thought of editing. Now as an editor of feature horror films and horror documentaries (Swamphead, Sleepless Nights: Revisiting the Slumber Party Massacres, and Screaming in High Heels: The Rise and Fall of the Scream Queen Era), I firmly look back at this one small section of Document as the spark that began my obsession and love with the editorial process.